Hi! My name is Ethel Karinen, I am currently a sophomore in high school, and have been racing mountain bikes for about ten years. This season I started racing in the National Interscholastic Cycling League (NICA). 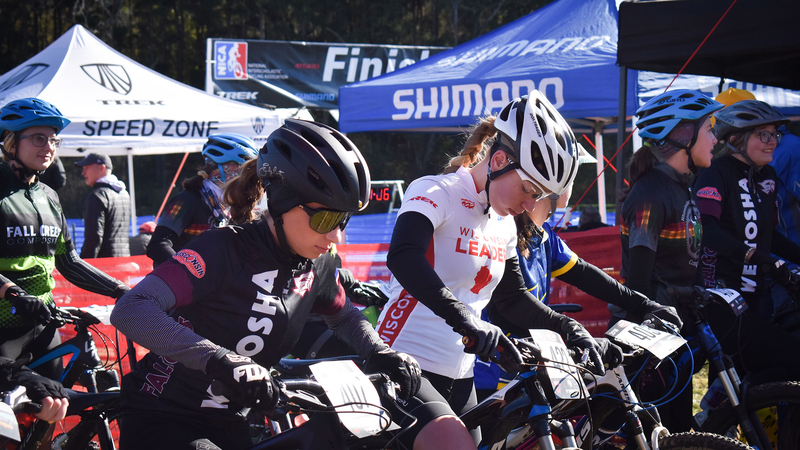 This organization develops mountain biking programs for student-athletes across the U.S. and helps support leagues for high school mountain bikers. I began racing in NICA races with the 906 Adventure Team at the beginning of this year and it has been a great season of learning and growing. I hope that by reading about my experiences, you will see what racing is all about hard work, perseverance, and most importantly, just getting outside and having FUN! The National Interscholastic Cycling League’s (NICA) season opener race was held in Waukesha, WI at the Minooka Park. I had pre-ridden the course on Saturday, which was a fast, flowy mixture of two-track and single-track trail and it looked like it would be a lay-it-all-down sort of race on Sunday. Was I ready? I felt ready. Nervous? Definitely. I’ve been racing bikes since I was five years old, mostly local ones where there wasn’t much youth competition. Now I found myself surrounded by literally HUNDREDS of high schoolers on bikes. I was stoked. It was an entirely different experience, not only racing against high schoolers—but racing against girls—and girls that are also sophomores in high school, just like me. On race day, I was ready to do this. The high school girls from my team (906 Adventure Team) warmed up together, and I was feeling good. I started in the second row of my category, not really knowing what to expect, just planning on giving it all and hoping that would be enough. We had two laps to do. Right off the bat, another girl and I had established a pretty big gap between us and 3rd place. We were going back and forth, exchanging the lead position. Leading at the end of the first lap, I gave the second lap everything, and it felt good. I was able to establish a minute-and-a-half lead between the girl and me in 2nd place. I crossed the line as the leader. First place was not something I expected, mainly since it was my first race and first year racing at NICA, but I was stoked to have been able to pull off the win and take home my first Wisconsin Leader jersey. The second race of the season was held at the Nordic Mountain Ski Resort in Mt. Morris, WI. The course for this race compared to the Minooka Mania was different. It was a climbers course. Part of the course looped up the ski hill but it also combined technical, curvy descents. After pre-riding the course in unusual 80-degree weather, I was feeling more confident about how the race would go, mostly because the trails reminded me of the ones that I’m used to riding up here, in the Upper Peninsula of Michigan. After warming up on race day, I was feeling uncommonly nervous, but I felt good after the ”GOOO!! !” was shouted by the race announcer and I was finally able to get my legs moving. Wearing my first Leaders Jersey at a race was a weird feeling. It was hard not to feel pressured about getting good results or coming out on top again. After we got into the single track, my main focus was creating a significant gap between myself and the rider second place. The hills didn’t come into play until about halfway through the race, so I knew I wasn’t going to be able to get away on the flat, fast single track before then. As soon as the hills hit, I gave it all I had and tried to make the largest gap I could while trying not to blow up in the heat. I had to keep in mind that I had two laps to complete, not just one like the point-to-point races I’m used to doing. After lap one, I had about a 1-minute gap between me and second, and knew that I needed to lay down everything I had for lap 2. In the end, I crossed the finish line with about a 2-minute gap. The heat was harsh, and I’ll say that I ate more than one mosquito while riding, but altogether I felt I had a good race and was happy that I would be representing the Leaders Jersey at race #3. Follow Ethel’s NICA progress in her next blog post — posted soon!